The 2014 Eurovision Song Contest Final drew massive audiences and over five million Tweets as Europe came together to witness Austrian performer Conchita Wurst’s victory. 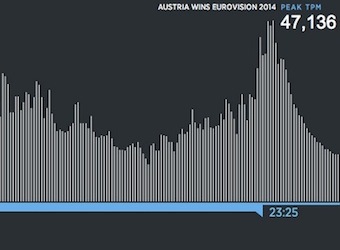 According to Twitter’s UK team, tweeting peaked during the announcement of Wurst as the winner, followed by her performance earlier in the night. And @ConchitaWurst won not only Eurovision 2014, but also gained number of followers on Twitter. The third most tweeted about moment came as France’s Twin Twin performed its song ‘Moustache’ (39,353 tweets per minute). Interesting, because Twin Twin placed dead last with only two votes (for comparison, Wurst scored 290).